Lou Prucha was born April 29, 1917 in Dodge, Dodge County, Nebraska, the first of three sons of George and Clara (Martinek) Prucha. The family moved to Omaha, Douglas County Nebraska in the early 1920's. 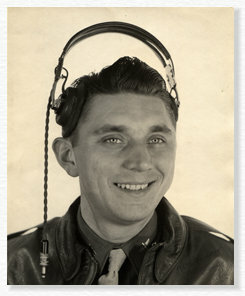 Lou enlisted in the U.S. Army Air Corps on December 9, 1941. He was in Basic Drill Instruction for 3 months, Clerical School in Ft. Logan, Colorado for 4 months, and graduated from the Air Corps Clerks course of instruction at the Air Corps Technical School on April 29, 1942, marking his twenty-fifth birthday. • Preflight Pilot Training, Maxwell Field, Alabama - August 15, 1942 to October 17, 1942. • Primary Pilot Training, Souther Field, Americus, Georgia – October 21, 1942 to December 27, 1942. • Basic Pilot Training, Greenville Army Flying School, Greenville, Mississippi – December 27, 1942 to February 27, 1943. • Advanced TE Pilot Training, George Army Air Field, Lawrenceville, Illinois – February 28, 1943 to April 29, 1943. He graduated as a member of Class SE-43-D, received his "wings", was rated Pilot, was officially appointed 2nd Lieutenant and ordered to Active Duty on his 26th birthday, April 29, 1943. He remained stationed at George field until the end of May when he was given 10 days leave, during which time he returned to Omaha, Nebraska and married Mary Margaret Brennan on June 2, 1943. Lou reported back to duty on June 9, 1943 and continued training on the Douglas A-20 "Havoc" twin-engine light bombers at various bases stateside along with gunners Sgt. Leland C. Ferguson and T. Sgt. Glenn C. Wilson until September, 1944 when they were assigned to the 668th Bombardment Squadron (Light), 416th Bomb Group of the 9th Air Force, just as the group was moving from England to station A-55 at Melun, France. Lou flew 37 combat missions between December 6, 1944 and April 26, 1945; primarily against German railroad, communications and marshalling yard targets from air bases in France. While the majority of his training was performed flying A-20's, he piloted most of his combat missions in Sugar Baby (plane 5H-S, serial number 41-39274, tail number 139274) the new Douglas A-26 "Invader". He advanced his formation flight position throughout his missions and was designated flight leader for his last three missions. 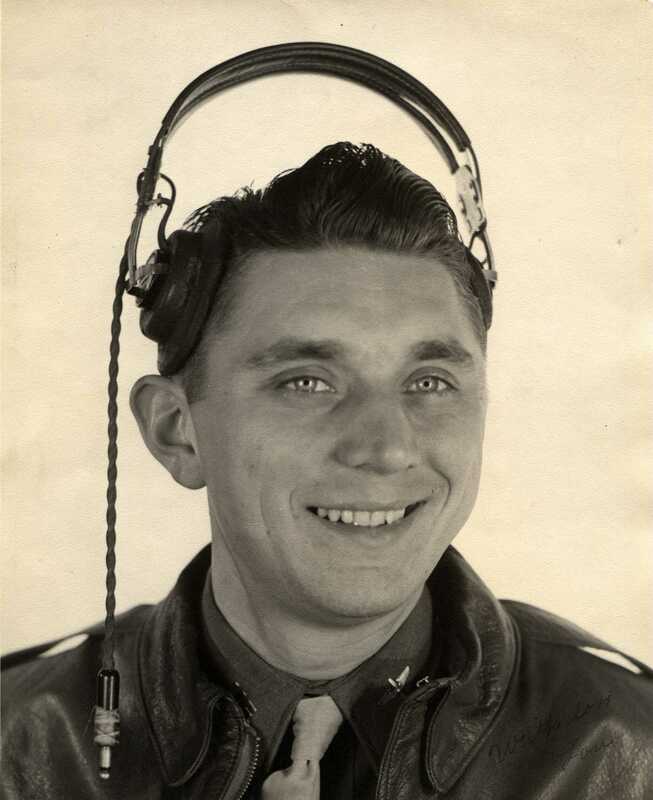 Lou was promoted to 1st Lieutenant February 9, 1945 and the next day the 668th Bomb Squadron moved to base A-69 near Laon/Athies, France to be closer to the front lines. Through his military career, Lou was awarded the European, African, Middle Eastern Ribbon with 3 Bronze Stars; 6 Oak Leaf Clusters and 1st Silver Oak Leaf Cluster to his Air Medal; the American Theatre Ribbon; and Victory Medal. Lou participated in the following three major European Battles and Campaigns – Ardennes, Rhineland and Central Europe. After the European war was officially over, Lou remained stationed in France at bases A-59, Cormeilles en Vexin (May 1 to July 13, 1945) and A-74, Cambrai (July 17 to August 30, 1945), continuing training in preparation for transfer to the Pacific Theater of Operations. Fortunately, the war with Japan ended before he was reassigned. Lou returned to the states via the ship S.S. Fayetteville Victory from September 8-18,1945, and was honorably discharged on January 14, 1946. He remained in the US Air Force Reserve and the Nebraska National Guard until 1951. Lou and Mary had six children together and raised their family in Omaha and later Bennington Nebraska. Lou passed away January 16, 1981 and Mary followed just over 21 years later on May 9, 2002. Ralph Conte - Ralph wrote the history of the 416th Bomb Group in his book "Attack Bombers We Need You! A History of the 416th Bomb Group", and graciously permitted me to use excerpts from his book in these pages. Jane and Doug Enman - Jane and Doug publish the annual 416th Bomb Group Newsletter, keep all members updated via emails, and Jane has transcribed many unit histories for the web (available at 416th Bomb Group Website). Lee and Bert Ferguson - As noted above, Lee trained with my dad and flew as gunner on 17 of dad's combat missions. I was fortunate to get to visit personally with Lee and Bert a couple of time prior to their passing, and they treated me as a true friend. Jim Phillips - A fellow A-26 pilot in the 668th Bomb Squadron during the time my dad was assigned. While I only got to know Jim through email "conversations" and never had the pleasure of meeting him in person, Jim also was a true friend. He always patiently answered my many questions, usually providing a humorous story to go along. Wayne Sayles - Wayne put together the 416th Bomb Group Website, dedicated to the memory of the 416th Bomb Group, and included a memorial page for my dad. Wayne actively promotes and works on keeping the 416th Bomb Group memory alive by recording interviews with veterans, organizing reunions as well as writing books such as "First to fall: the William E. Cramsie Story". I also want to thank Wayne for allowing me to use materials from his web site to (hopefully) improve my own pages. Mike Seeber - Who has helped me many times with information he has gathered in his own research and in particular by allowing me to "copy" his web design ideas, mostly from his site The Story of Glen Eldon Seeber, who lost his life September 10, 1944. Carl Sgamboti - Carl and his team at the New England Air Museum are restoring the Douglas A-26C "Invader" aircraft "Reida Rae" (Douglas A-26C Restoration Project) that flew with the 671st Bomb Squadron, and he has also been instrumental in getting the 416th Bomb Group Memorial Exhibit setup. Carl graciously provided me with some of the "Worms Mission" documents he uncovered during his research and I very much appreciate Carl's willingness to allow me to use information from his web pages for this site. All the Veterans and Members of the 416th Bomb Group for all their sacrifice and willingness to share.